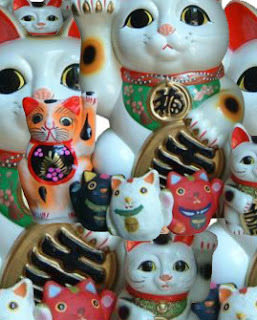 Yesterday night I passed by a shop full of these Japanese lucky cats. "There was once an old and lonely man who owned a small shop. The man had no family and consequently relied solely on his shop for income. Business was very bad and the old man was running out of food and had no money to buy more. The day came that he cooked his last bowl of rice. Just as he sat to eat his last meal a small and hungry kitten came to him and rubbed against his leg mewing and purring pleadingly. After a time the old man thought that while he had nothing left to live for, the cat was still young and had a full life ahead of it, and so he gave the last of his food to the little cat. The next day the old man awoke and as he made preparations to die there came a steady stream of customers through his doors. At the end of a very busy day, the old man, wondering at this turn of events, searched for the cause and found the small cat sitting upright by his front door beckoning to all who passed by."